Wow, this piece is a stunner. This double sided porcelain flange sign is an advertising sign for Buffalo Motor Oil. The main colors of the sign are a muted yellow with black illustration. There is a large buffalo in the center of the sign that was done as a pencil art illustration. The text and lettering is all extremely unique. The person who designed this sign has a sense of pride and understanding. 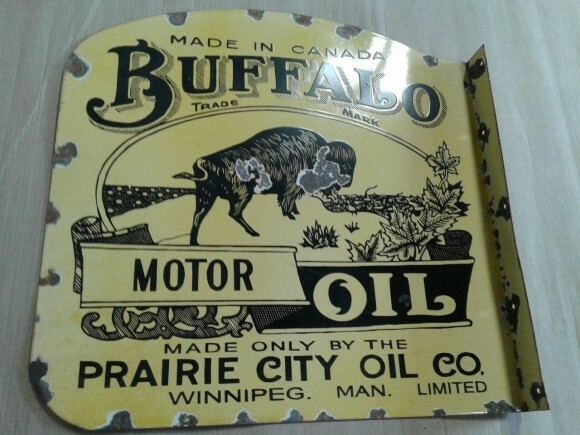 The text on the sign reads “Made in Canada, Buffalo Motor Oil Trade Mark Made Only By The Prairie City Oil Co. Winnipeg. Man. Limited. If you find this piece, you have a real gem of a design.